I met Barbara Barnes Sims when we were both laborers in the fields of the Lord – or, at least, when we were both lecturers on cruise ships sailing the Mediterranean. And I remember her telling me once she was writing some kind of book about Sun Records. The idea sounded interesting enough. 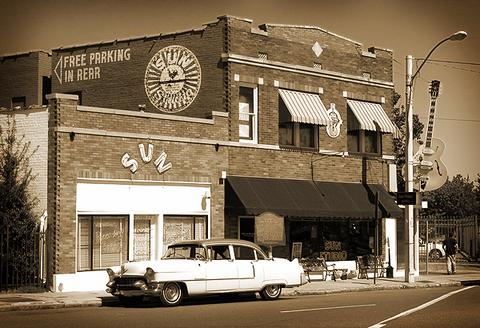 Sun, founded in Memphis by a rock and roll visionary named Sam Phillips, was an essential chapter in the history of all modern American music. As much as anybody could be said to have, Phillips “discovered” Elvis Presley. And what he did in the process – looking mostly for white artists who captured the raw emotion of black music – would give the world virtually every musical style and every hit song that’s happened since. Maybe she mentioned it or maybe she didn’t, probably at dinner as our ship headed out to sea, but I missed that Barbara had actually worked at Sun, that the book she was writing was no mere history but a personal memoir. The Next Elvis: Searching for Stardom at Sun Records (LSU Press, $26) is a remarkable personal memoir indeed. As Barbara signed on “after Elvis” – Phillips famously sold his contract to RCA, insisting for the rest of his life the sale kept the lights on – she missed that crazy-famous chapter but caught every bit of the next one. Her life at Sun, and therefore this book, was and is about what everyone understood to be the search for “the next Elvis.” If you’ve seen the live-concert Broadway musical The Million-Dollar Quartet, you know the basic history already. The musical, ostensibly recreating the single night that Elvis played a few songs in the Sun studio with Johnny Cash, Carl Perkins and a typically unmoored Jerry Lee Lewis, only sketches in some of the before and after. The Next Elvis tells us the rest of the story while weaving in the rest of the people. Unlike the musical, this book is about a young, shy, small-town Southern woman’s journey into, through and eventually away from what was an almost entirely man’s world. Barbara did the publicity for Phillips, which at that label meant she did pretty much everything. She called distributors and DJs to pitch new records, she called music writers to interest them in new artists and, among her most fascinating duties, she met with each entertainer to decide what to say on the album covers of each new LP. The very technologies and terms of these creations, these retail products, are the stuff of sheer nostalgia now. Yet we also get an almost-secret thrill watching Barbara figure out what’s special about each artist, thus helping supply the vocabulary we use about him to this day. There’s lots of interesting back-of-the-house gossip in these pages about Phillips (whom Barbara clearly adored, yet with mixed feelings, not least because he was her boss) and the rest of the Sun business operation. Even better, there are vignettes that tell us things we might not know about Elvis (she saw him only once), Cash, Perkins and Lewis, plus other musicians whose stars flickered briefly, at length or even more than once over many years, like Roy Orbison and Charlie Rich. In retrospect, none of these became Sam Phillips’ “next Elvis,” artistically or financially, and eventually Sun faded away. Yet in so many cases, if the talent didn’t flame out too briefly, these voices first heard in a tumbledown studio in Memphis became the soundtracks of our lives. On Tuesday Sept. 16 I will walk into City Park Stadium in New Orleans to hear a tribute band play all the old Beatles hits. The last time I entered the stadium, exactly 50 years ago that night, the Beatles were playing all the old Beatles hits. Except both they and I were young. 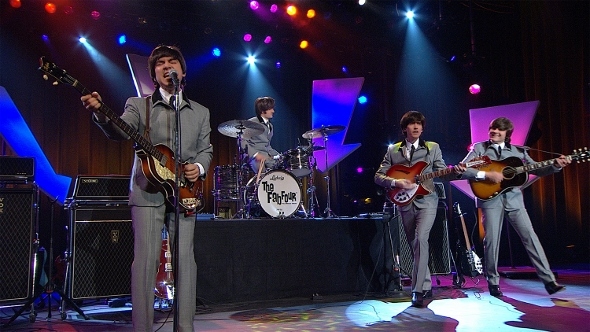 In one of the most lovingly nostalgic acts of self-promotion I can remember, the public television station in my hometown has not only produced an entertaining half-hour special about the Beatles’ visit but has created a full-scale live concert event at the stadium featuring a tribute band called The Fab Four. 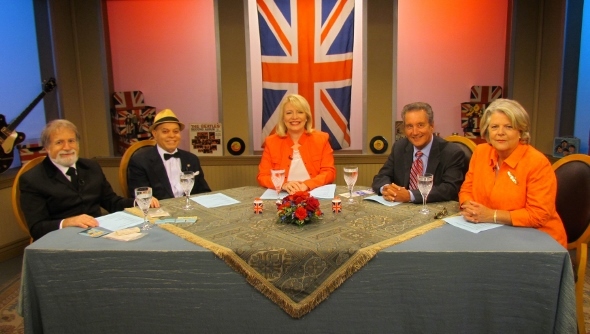 I just got a preview of the TV special, titled “When the Beatles Invaded New Orleans.” That and the fact I spent eight years talking about food every Friday night on WYES-TV’s Steppin’ Out program, with the same host (Peggy Scott Laborde) and possibly the same table, sealed the deal for me. 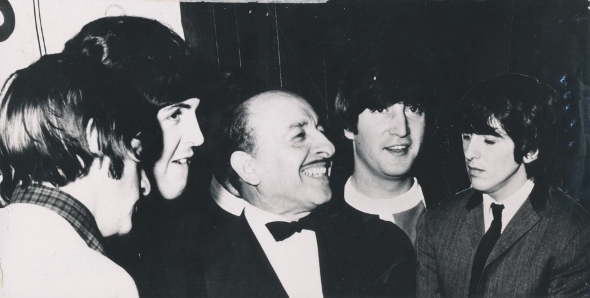 As I recall, my younger sister fell for the Beatles before I did – probably as it should be. I was 12 and not interested in music, but after a few weeks of listening to her and her friends playing bouncy hits like “She Loves You” and “I Want to Hold Your Hand” on her tiny pink 45 rpm record player, I was ready to commit. I was watching when a national TV personality named Jack Paar (look him up, children) played a jumpy, scratchy, black-and-white film of the Beatles performing in Liverpool, so of course I was watching when the group made its first of several iconic live appearances on The Ed Sullivan Show. Cutting to the chase, there was nothing I didn’t think I’d like about having thousands – no, millions – of girls throwing themselves at me, body and soul. Like so many other boys across America, I started a band of my own within days. Historical note: Neither The Runaways, nor our later, mildly psychedelic rendition The Upstairs Window, ever appeared on The Ed Sullivan Show. I took my sister to see the Beatles in New Orleans, dropped off at the gates by our parents; and as things went, that was surely my cover for liking them myself. There we were that night, up in the stands with 12,000 other screaming, shouting, crying kids, asking each other what song the band was playing because we couldn’t hear above the screaming. The night was a highlight of my life – Top Ten, surely. Many things moved and changed and grew after that night, many things began and ended, even the Beatles themselves. But when my kids, a couple years ago, gave me a colorized and framed reproduction of the City Park concert poster, I couldn’t imagine anything I’d never thought of but that made me smile more. Only two years after City Park, by 1966, both the Beatles and I were old hands. I convinced my parents to make our annual vacation trek to Boston, where my Dad was from, in time to meet up with the Beatles at the Suffolk Downs racetrack. By then, my sister and I knew enough to shove our way down in front of the biggest (and loudest) speakers I’d ever seen. The show was great, replacing those primal hits from 1964 with the complex harmonics and ideas of “Nowhere Man,” “Paperback Writer” and “Yesterday.” A few days later, the Beatles announced there’d be no more concert tours, at least partially because more and more of their songs were created in the studio, not on any stage. Still, whenever I think back to them or those times, I almost never think of my Dad’s hometown. I think of mine. Ironically, between my life’s two Beatles concerts, the closest we got to each other was August 19, 1965, when they played two sold-out shows, afternoon and evening, at the Sam Houston Coliseum – in Houston. All the radio stations in New Orleans organized charter busses to these shows, and I begged my parents to let me be on one. But they, oh so parentally, said No. So yes, I did get to Texas “as quick as I could.” But it wasn’t quick enough. Thanks to the WYES page on YouTube, “The Beatles Invade New Orleans, ” featuring memories by Beatles historian Bruce Spizer, musician Deacon John, retired New Orleans DJ Bob Walker and broadcaster Marcia Kavanaugh (like me, a concert survivor) will be available to all after its airing this Friday at 7:30 and again at 11 p.m. Tickets to the live 90-minute concert by The Fab Four on Sept. 16 are $35 (the real Beatles were $5, but that seemed a lot more money when I was 12), with a tempting VIP package available for $150. Anything and everything about the event can be found at www.wyes.org or by calling (504) 457-2934. I’ll see you there. And please, don’t be looking for a 12-year-old. Photos: (top) The Fab Four tribute band; (middle) the Beatles meet the mayor of New Orleans; (bottom) the WYES-TV special hosted by Peggy Scott Laborde. I hate fashion. I don’t like publishing elites. And hell, I don’t even love New York, despite a few gazillion dollars spent to make me. So I would seem an unlikely cheerleader for the play called Full Gallop, setting forth the acerbic wit and cynical wisdom of late New York trendsetting socialite Diana Vreeland, she of Harper’s Bazaar and especially of Vogue. 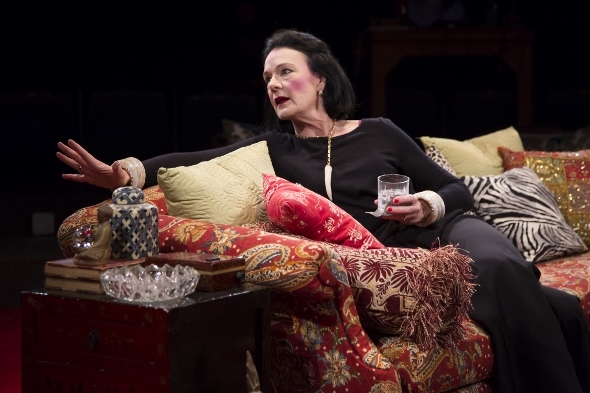 Still, the mostly one-woman show that opened last night at Stages is one of those rare theatrical epiphanies – when an actor so completely inhabits a role that, even if you’ve never seen more than still photos of Vreeland, you utterly believe you’re now watching her in action. Much the same thing happened with Hal Holbrook as a very old Mark Twain, whom he started playing as a very young actor. He was still the same old wonderful Twain, Holbrook let on to me backstage after one late-model performance – except he needed less and less makeup to look old. There are parallels. Sally Edmundson first performed Full Gallop at Stages 15 years ago. Though I didn’t see the show then, I’m told by those who did that the portrayal is richer now, more knowing and, in some ways, more sympathetic. She probably always nailed the physical particulars, starting with the signature mound of black hair, the endless drinking and smoking and, of course, talking dirt about other people. But it seems that something about Vreeland’s soul is onstage now that probably wasn’t there before, something more about how it feels to look out over the world from a very high, powerful place and then, suddenly, to not. That is the basic plot of Full Gallop by Mark Hampton and Mary Louise Wilson – or what I call, in any one-person show – the excuse. In other words, why is this person bothering to say all these things? The single evening catches Vreeland in 1971, five years after her beloved husband’s death to cancer and some time after her dismissal as editor from Vogue. She actually has very little to stand on, plus what she considers not a lot of money to do it with. She makes and receives phone calls all evening long, from prominent people in New York and on the West Coast, each time finding just the right way to reassure them that she still is a force. The conversations are hilarious, as even more so are her bitchy asides (to the audience) after hanging up. Also laugh-worthy is Vreeland’s ongoing intercom exchange about domestic matters with a French maid we hear but never see. Delightfully, the maid is played by Edmundson’s own daughter Maria, who happens to hold a BA in French. 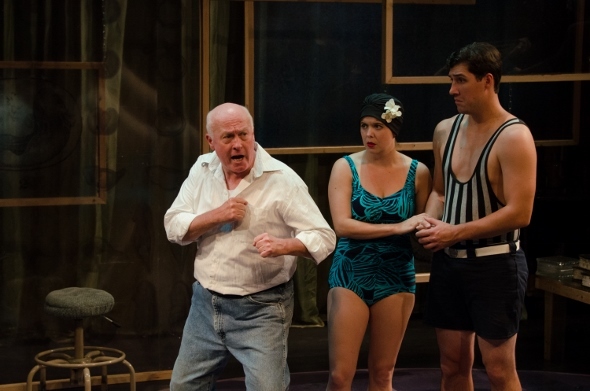 Directed by Stages artistic director Kenn McLaughlin with a lovely Park Avenue set by Jodi Bobvrosky, lighting by Clint Allen and costumes (well, one costume) by Nara Lesser, Full Gallop is a funny, rich, complex, engaging and surprisingly touching evening of theater. Pollywog, presented as a world premiere by the small, ever-inventive Houston theater company called Mildred’s Umbrella, is an intriguing evening of theater. It’s ambiguous and eloquent, wordy yet also spare, intellectual yet wildly physical. At times it’s like a ballet with talking. And maybe vice versa as well. 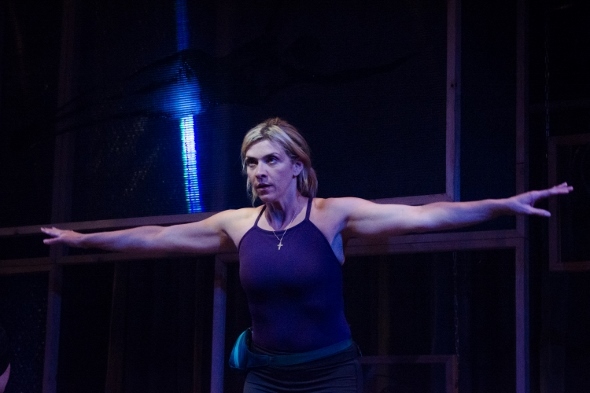 As best I can tell, the play written by Keian McKee and directed at Studio 101 by Matt Huff, is “about” what goes on in the mind of a long-distance swimmer of the sort who takes on the English Channel. Still, it doesn’t take long before this swim emerges as a metaphor for each of our lives, especially as the swimmer named Polly remembers the joys and sorrows of her mother and father (a strange and strained relationship, to say the least) and even gets visits from two famous swimmers who inspired her, Esther Williams and Johnny Weissmuller. The latter, of course, swam a stroke or two in the movies as the greatest Tarzan of them all. So… time is not a solid thing in Pollywog, presumably as Polly’s mind wanders stroke after stroke. We realize that her mother is now dead, and probably her father as well. Esther and Johnny are dead in real life, real time – indeed, except for on this stage, she has presumably never met either. Yet here they are, participating in scenes from throughout her life, giving her advice and correction, cheering her on toward the sand that waits at the far end of her swim. That, apparently, is what Pollywog is “about.” But what makes it worth seeing is what we see (and to some degree, hear) as the tale unfolds. Thanks to Huff and longtime local dancer/choreographer Jennifer Wood, swimming itself becomes an act of dance. Time and again, Esther and Johnny form geometric and poetic patterns with their bodies, and sometimes even do creative things with Polly, like stretching her out across a turning chair to swim on the air, spinning her between them as she slowly pulls and kicks. It’s not necessarily complicated, but it’s something I’ve never seen on a stage before. Often, it’s nothing short of beautiful. Two of the characters, Polly and her mother Jule, have the most serious acting to do, for each has to switch repeatedly through ages and conditions in time. In Polly’s case, that means Courtney Lomelo has to find ways to be a grown woman in quick transition with being a small child, and then quickly back again. She handles the task with instinct and skill, using her voice as a prompt particularly well. Celeste Roberts as Jule has an even bigger job, playing the mother before and after a severe stroke. This requires not only theatrics but a bit of medical understanding. The mouth that droops on one side is an especially effective key to telling us “which one” she is at any given moment and to making post-stroke Jule come alive. Veteran actor James Belcher does fine work as husband Mort, a hard-working but argumentative sort who travels the roads selling cemetery gravestones, a none-too-subtle reminder that death lurks beside and behind every hope and dream we have. It’s not a morbid thought in Pollywog but a realistic one. Autumn Clark and Jason Duga show off their bodies and their balance impressively through the entire 90-minute, no-intermission running time. Photos: (top) Courtney Lomelo; (bottom) James Belcher, Autumn Clark and Jason Duga, by Gentle Bear Photography.